Will Daniel Ricciardo Ever Be Champion? 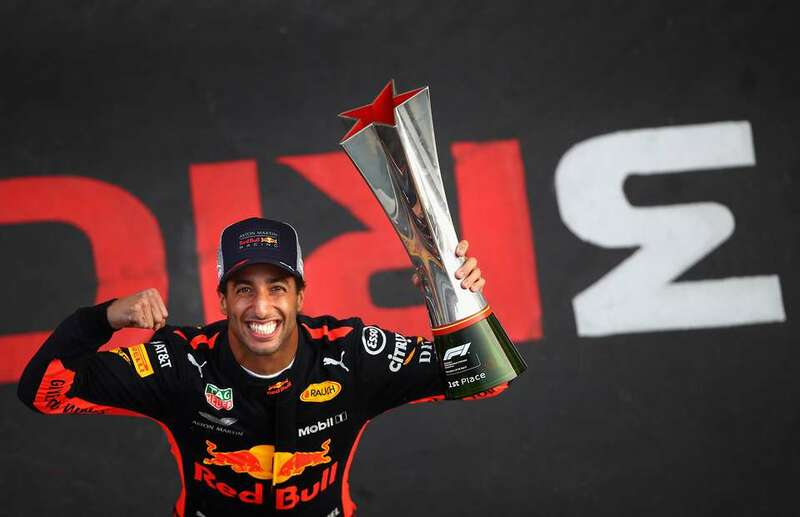 With 140 starts and 7 victories to his name, Daniel Ricciardo should be enjoying the golden years of his career at the pinnacle of motorsport, Formula One. By now, at the age of 29, you would expect Ricciardo to be seriously challenging for titles, going into each and every race weekend knowing he has a very strong chance of adding to his victory tally. Alas, it hasn’t quite gone to plan and his Red Bull team have floundered in the hybrid-era of Formula One, the Renault engine still lagging behind Mercedes and Ferrari. In the first year of the new hybrid engines, Ricciardo seriously upset the apple cart by challenging the established Sebastian Vettel in only his first year at a top flight team, his third season overall. But the three wins for Daniel in 2014 only came as the team found themselves as the best of the rest, Mercedes dominating and Ferrari floundering. As soon as the Italian marque sorted themselves out though, Red Bull were relegated even further and the victories almost completely dried up. None in 2015, one each in 2016 and 2017 and two so far in 2018 with the possibility of a couple more before the end of the year. It isn’t a startling record, and by his apparent abilities behind the wheel, it should be a lot better. And it is this desire to improve that leads Ricciardo to probably the biggest decision of his life: Should he stay with Red Bull or move on to pastures new? Next year will see the Red Bull car with a new engine partner, Honda. And it is surely this very fact that is playing on Daniel’s mind. Having spent what seems like an eternity in the back of a McLaren and going nowhere, the British team sacrificed an awful lot of money to end the Honda relationship early for this year, Woking choosing Renault power instead. Red Bull junior team Scuderia Toro Rosso stepped in to take the supply which was actually a canny move from Milton Keynes-based Red Bull, using the junior team to assess its potential, the parent team having been looking for a way to divorce Renault since, well, 2014. The million-dollar question is though: is the Honda going to be better than the Renault? But before we even consider the million dollar question, we have to look at the billion dollar question: would a Renault-powered Red Bull ever be allowed to win championships again now the French manufacturer have a factory team again? Would they really let Red Bull beat them at their own game essentially? This factor was probably very important to the thinking of Red Bull bosses when looking at the future. For sure the Renault is a little better than the Honda at the moment, but Honda will eventually improve and get it right, and when they do, it will be Red Bull who will be able to take advantage of it, assuming they continue to build a great chassis. The mighty McLaren got fed up of waiting though, and the switch to Honda for Red Bull is a gamble that could see them fall backwards in a similarly sad way. And if that happens, you can bet your bottom dollar company owner Mateschitz will put the teams up for sale and leave the paddock. So the gamble for Ricciardo is about engines more than anything. His affable personality will fit in at any one of the teams on the grid, fitting in isn’t really an issue for the Australian. Ferrari are probably sorted now for the next few years, Sebastian Vettel will keep negotiating one or two year extensions to his contract while he is winning, and when team mate Kimi Raikkonen finally bids farewell to Maranello for the second time, Charles Leclerc will be slotted into place. Likewise at Mercedes, Lewis Hamilton will keep extending all the time he is winning, and the relationship with Valterri Bottas seems to work well. When Bottas is moved on, there are a number of drivers to chose from, some Mercedes Junior-alumni, some not. And so gazing into the crystal ball, that leaves Red Bull and their great chassis but questionable engine, and I suppose a long-term shot with the factory Renault team. I fear Daniel Ricciardo may have just become a huge talent who will never win the world championship he so desperately wants and so richly deserves. 03/08/18: Ricciardo decided to switch to Renault for 2019 and 2020. Image copyright Red Bull Racing.